The Zodiac sign of Pisces is active from February 19. up until March 20. The constellation of Pisces is, at least in principle, visible in the Southern sky during the second part of month October and throughout November. It is not easily detected, as the stars that comprise it are rather faint and there seems to be no brighter stars. However, this constellation occupies a large space close to the Equator, and is situated between the constellations of Aquarius and Aries. The two fishes are arranged in such a way as to form a lose connection via an elongated ribbon. Known to the ancient Greeks under the name of Ichthyes – the Fishes – the Zodiac sign of Pisces has always been connected to spirituality and religious ideas. The Ichthyes were a pair of large river fishes that rescued Eros and Aphrodite (aka. Cupid and Venus) who were trying to escape the monster called Typhoeus. According to other sources, it was Eros and Aphrodite who were disguised as fishes in order to escape the monster, which according to Homer had snakes instead of fingers and a hundred fiery dragon heads. The third version has it that the fishes actually facilitated the birth of goddess Aphrodite. 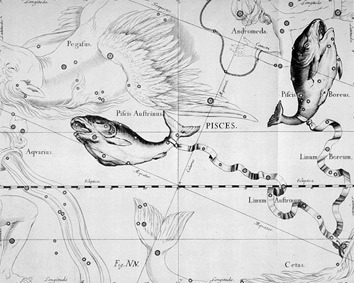 Anyhow, the end result is the same – the fishes were rewarded and placed in the heavens by goddess Minerva to symbolize the constellation of Pisces. Interestingly, the early Christians used the Fish symbol to symbolize the Christian faith. The ruler of the House of Pisces is considered Jupiter. The co-ruler and ruler of the more developed Pisces personalities is Neptune. Before the discovery of Neptune in 1846, Jupiter was the sole ruling planet of this sign. Jupiter influences the development of intellectual faculties and creative ideas. Neptune is the planet of illusion and mystery. The energy of Neptune is directed toward the development of the higher mind and spiritual faculties of mankind. 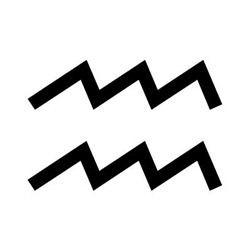 The symbol of Pisces clearly indicates the dual nature of this sign. The duality found here is probably the most pronounced amongst all of the Zodiac signs. Pisces individuals are prone to changing their minds and often are susceptible to sudden impulses, much like the scintillating waters that represent the native element of this sign. 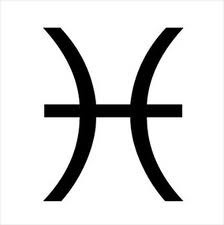 As much as they are opposing anything that brings disorder to their calm temperament, Pisces people possess adaptable personalities and are capable to accept any change of circumstances that comes their way. Their feelings and emotions have many facets, but they are always strong and have great appreciation for beautiful things. 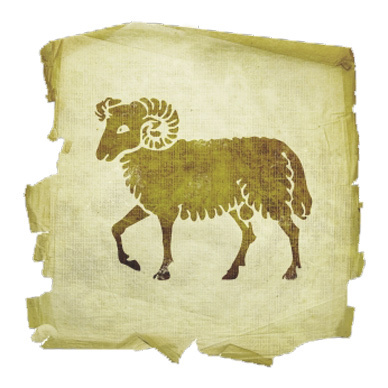 Attracted very much by the pleasures of life, people born in this Zodiac sign still have enough prudence when it comes to deciding whether or not to engage in passions and pleasures of life. What is important to this sign is not being overly susceptible to outside influences. The mind of people born under this Zodiac sign is acquisitive, philosophical and imaginative, while at the same time also very accurate and persistent. They can be lacking in the area of self-esteem, which can lead to failures in recognizing and taking the best opportunities for personal advancement. Pisces are fond of positions of management and increased responsibility. They possess precision and extreme punctuality, and often can run two occupations simultaneously. Pisces can be very successful artists, actors and writers. They can be good managers, sailors and teachers. Pisces love peaceful environment and dislike conflicts and discordant situations. In spite of that, they can be rebellious if excited, and can be slow to recover from the consequences of their anger. The negative side of people of this sign can be related to selfishness, secretive conduct, discontent, and extravagance. In business relations, the negative Pisces can show dishonesty and trickery. The House of Pisces rules over the feet, so people born in this astrological sign can have health problems related to this area of the body. Pisces are inclined to back problems, colds, respiratory and circulatory disorders and nervous breakdown. Being very sentimental, it is important for them not to take unhealthy or junk food, nor to consume alcohol, drugs and smokes. Pisces are impressionable people and can be very affectionate, which makes them fitted for family life. However, they usually weigh and consider their options for a long period of time before committing to marriage. They can have good personal relationships with those burn in the Zodiac signs of Capricorn, Cancer, Scorpio and Taurus. According to the modern and traditional birthstone charts the main birthstone of Pisces is Amethyst. This is also in accordance to the mystical birthstone chart. 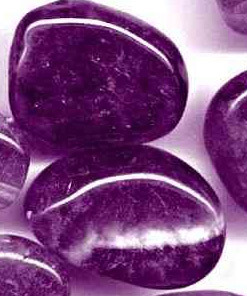 Amethyst is a semi precious stone that comes in various shades of purple color. Originally regarded as precious, and therefore very expensive, its price went down after discovering great quantities of quality Amethyst in Brazil. Amethyst with its nice purple hues has excellent soothing influence, calming the nervous system and improving the vitality of the wearer. In fact Amethyst can be considered universal gemstone that can be worn equally by all Zodiac signs without any adverse effect.